Martin P.M.3 discussed by THE EDITOR. This article is a somewhat unusual one for THE AIRCRAFT ENGINEER, being an examination of a design by the American ДальшеMore>>> aircraft designer, James Martin. For the benefit of readers not intimately familiar with the early history of flying in this country, it may be pointed out that James V. Martin was, for a considerable period before the war, connected with the Grahame-White Company at Hendon, where he designed a little pusher biplane of the "box-kite" type that was so popular at Hendon in those days. Mr. Martin went back to the United states, where he has been working since. Some years ago he paid a visit to this country, when he visited FLIGHT offices, bringing with him a sketch design for a tiny aeroplane in which the undercarriage was designed to fold up into the fuselage. A special feature of the design was that the pilot was intended to lie down prone in the fuselage, looking out through windows, this peculiar arrangement being chosen in order to reduce the cross-sectional area of the fuselage to a minimum. This sketch design was published in FLIGHT at the time. James V. Martin has for years been a seeker after aerodynamic efficiency, and was among the first to patent retractable undercarriages. It is not, therefore, to be wondered at that this feature is incorporated in his latest design, published herewith. In fact, although the designer does not specifically state this to be the case, one may assume that the twin-fuselage arrangement was chosen, among other reasons, for the greater facility with which retractable undercarriages can be incorporated in this manner. Accompanying the general arrangement drawings, wind tunnel curves and performance curves sent to us by Mr. James V. Martin was a non-technical article entitled "How to Make the Commercial Aeroplane Pay." This article was, however, obviously written with the object of explaining, in non-technical language, to the business man not familiar with the technical aspects of air transport, methods whereby the aerodynamic characteristics of aeroplanes can be improved, and the effect, in dollars and cents, which such improvement has upon the dividend-earning capacity of a machine. For publication in THE AIRCRAFT ENGINEER it was not thought that this article was quite suitable, and the Editor decided to describe the machine from a rather more technical point of view, quoting from Mr. Martin's article such passages as appeared relevant to the more technical treatment. In order to appreciate the raison d'etre of the Martin P.M.3, one should know that Mr. Martin has for many years been a believer in the bi-convex wing section, holding the view that this type of section holds out promise of good L/D combined with a reasonably high maximum lift coefficient. Mr. Martin has designed several machines with wings of this section, and the one under discussion here shows a bi-convex aerofoil section with very sharp "nose." The monoplane type of wing has been chosen, and as already mentioned, two fuselages, each carrying an engine and accommodating passengers and/or goods, are another feature of the design. The first step in the evolution of the Martin P.M.3 was the testing of a model in the Gottingen wind tunnel. A photograph of this model is given herewith. We have by us a photostat copy of the original Gottingen curves, on which it is stated that the wing area of the model was 0-2385 sq. m. (2-57 sq. ft.), and the lateral axis was through the foremost point of the wing plane. As indicated on the chart giving the wind tunnel results, published herewith, the model was tested with and without undercarriages, and with tail-settings of 0, -10, and +10 degrees. The maximum L/D obtained was 17. With corrections for scale this is, Mr. Martin states, increased to 18, a very good result indeed. Compared with the general run of commercial aircraft, a maximum L/D of 18 is, of course, extraordinarily high, and if the large machine contemplated can be made to have the same high efficiency, the aspect of commercial aviation should be considerably changed, and the day brought much nearer when aviation can pay for itself without Government subsidy. The subject is one of such importance that the present design appears to merit close inspection. If the horse-power of the two machines is compared, i.e., power required to drive the two machines at the same speed, say of 110 m.p.h., the thrust of the "BC" machine, which Mr. Martin claims to have, at that speed, an L/D of 4 only, will require to be one-fourth of the total weight. At the same speed the L/D of the P.M.3 is 20, and the thrust required is only one-twentieth of the total weight. If the paying loads are compared, it is found. Mr. Martin says, that the "BC" machine weighs, roughly, as much as it carries, i.e., if the machine weighs, without fuel, 10.000 lbs., it can carry 10.000 lbs., and its total loaded weight will be 20.000 lbs. With a lift-drag ratio of 4, this machine would require horsepower for 5,000 lbs. thrust at 110 m.p.h., and a quantity of fuel in proportion to this power. The P.M. type, on the other hand, would only require power for 1,000-lbs. thrust at the same speed. If the P.M. machine required 200 lbs. of fuel per hour to drive it at this speed, the "BC" 'plane would require 1.000 lbs. of fuel per hour, or, roughly, 7,000 lbs. on the New York-Chicago trip, leaving 3.000 lbs. for paying load. Assuming that the light weight of the P.M. machine was the same as that of the "BC," the more efficient machine would have a pay load on this trip, at the same speed, of 8.600 lbs. Mr. Martin points out that this supposition about weight would be wrong if the P.M.3 motors were proportioned for only 110 m.p.h., because in that case the motors would weigh one-fourth of the weight of those required to drive the "BC" type. He claims that this difference in motor weight, together with the simpler construction of the P.M. machine, would equal the fuel weight, so that the New York-Chicago passenger and fuel load for the P.M.3 at 110 m.p.h. would be 10,000 lbs. The P.M. machine has four times the required power, and, in fact, is claimed be capable of 140 m.p.h. on one of its two 800 h.p. motors, the excess being employed for accomplishing that which would be impossible to the "BC" machine, i.e., a speed of 185 m.p.h., or New York-Chicago in 3 3/4 hours. Allowing for a slight slip on the part of Mr. Martin in using a maximum L/D of 20 instead of that of 18 indicated by model tests, the reasoning is sound enough, the only doubtful point being whether the light weight of the P.M. machine can be kept down to that of the "BC" type. An examination of the drawings indicates that the overall span of the P.M.3 is 102 ft., the chord 17 ft., and the wing area 1,700 sq. ft. or so. Now, a cantilever monoplane wing of this size is likely to be a good deal heavier than a biplane wing structure of the same area. (We assume, of course, from his reference to the "birdcage," that Mr. Martin is referring to a biplane with the usual strut and wire bracing.) In the data printed on the sheet of G.A. Drawings sent us, no detailed wing weight is stated, but the following weight estimates are given: two propellers, 170 lbs. ; two motors. 2.280 lbs. ; two pilots and instruments. 400 lbs. ; two undercarriages, 600 lbs. ; tanks, ailerons, radiators, wings, 4.200 lbs. ; two fuselages, 1,000 lbs. ; horizontal surfaces, 220 lbs. ; two rudders and skid, 130 lbs. Total empty weight. 9,000 lbs. Whether or not these figures are practically attainable we cannot say. To us it seems somewhat doubtful. Unless they are most of Mr. Martin's argument falls to the ground, since a serious increase in wing weight would have a pronounced effect on the useful load. In his article Mr. Martin arrives at 5,000 lbs. as the paying load of his machine on the New York-Chicago flight (non-stop). As he has evidently used an L/D of 20 instead of 18, and if we assume the empty weight of his machine to work out somewhat greater than estimated, the difference between the 3,000 lbs. pay load of the "BC" machine and that obtainable with the P.M. type might not be quite so great as the figures indicate. It would be interesting to have the views of British designers on the P.M.3. and we are sure Mr. Martin would welcome a discussion of his design. THE MARTIN P.M.3: Photograph of the wind tunnel model. 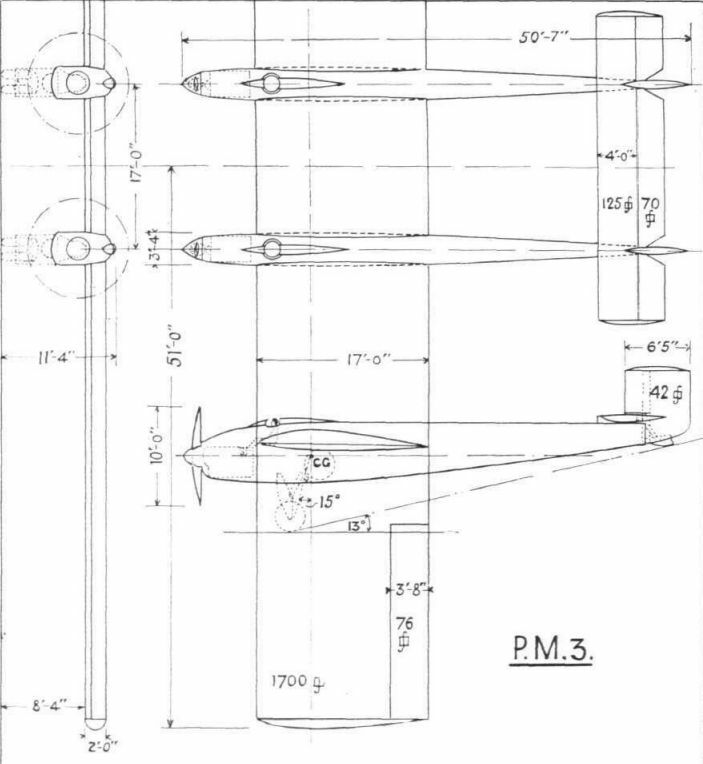 THE MARTIN P.M.3: General arrangement drawings.